As promised, I’m reposting Weeble Cthulhu from earlier this year so he’s hiding in amongst my daily art for those seeking out my (so far rather small) series of Lovecraftian weebles. 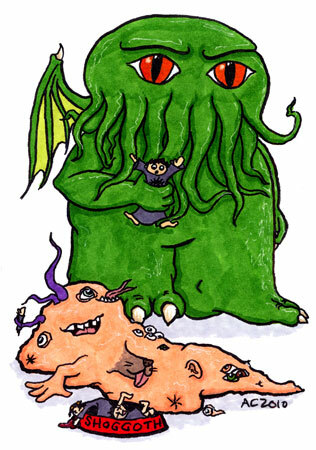 He’s got his pet Shoggoth with him with his bowl of cultist snacks and everything. I made a greeting card out of him for Valentine’s Day that said, “Cthulhu wanted to give you a heart, but they were all too small and squishy.” They sold so well I took off the “Happy Valentine’s Day” and have left them up on the shop ever since. Weeble Cthulhu, 4″x6″ pen and ink and Copic markers on a watercolor postcard.